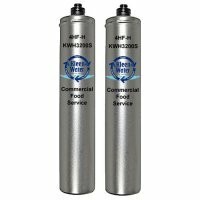 The 4HF-H Hoshizaki (KWH3200S) replacement water by KleenWater is rated for an impressive 28,000 gallon capacity at 4.2 gallon per minute flow rate. This is an ideal choice for the commercial food and beverage industry. It is recommended to change this cartridge every 6 - 12 months.